Years of planning helped turn a Cincinnati park into an area attraction while maintaining its historic character. 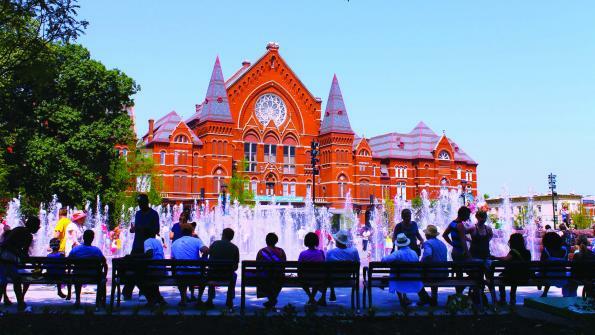 The renovation of Washington Park in Cincinnati was made possible by a public-private partnership that transformed an aging six-acre historic park into a new centerpiece for the community and region. Washington Park is located just north of downtown Cincinnati in the Over-the-Rhine neighborhood. When Cincinnati Public Schools determined that it no longer needed a school on a two-acre site bordering the north side of the park, it offered the property to the Cincinnati Park Board. In partnership with the Cincinnati Center City Development Corporation, the park board developed a plan to completely renovate the existing park and construct a 450-car underground garage below the park expansion area. The master plan for the $47 million renovation and expansion was developed through an extensive community participation process. The city provided $14 million in funding, $26 million came from private grants and loans, and the state supplied the remaining funds. In July 2012, Washington Park reopened to widespread acclaim. The design maintains the park’s original pastoral and historic character, along with its mature trees. The park’s historic bandstand built in 1911 was restored, extensive landscaping installed, and new features and amenities added, including an 18,000-square-foot playground, a dog park, an event lawn and stage, a granite-paved plaza, and a large interactive fountain with more than 100 water jets that respond to music. With a focus on sustainability, the park features five vegetated green roofs and dry wells that divert stormwater away from the city’s aging combined sewer system, instead sending the water into sand seams below the park.